Larger body and decal allows for a viewing distance of up to 40m. Powered by a LiFePO4 lithium battery and suitable for wall or ceiling mount. EXJUMBO40ML is best suited to long-distance viewing applications. 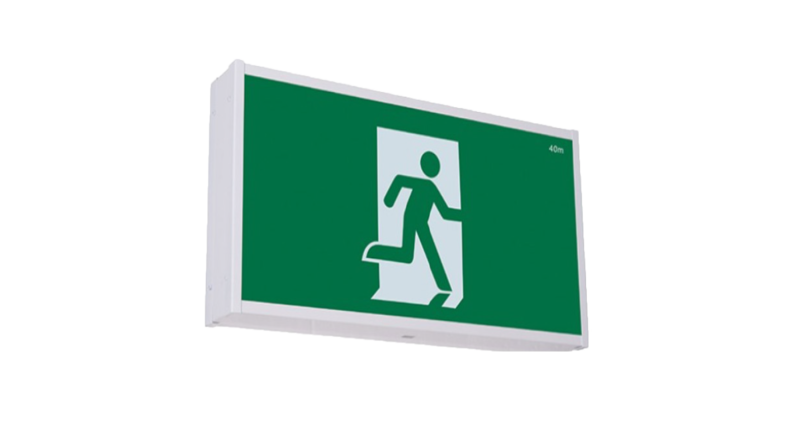 The 6W LED Jumbo Exit Light has a powder-coated metal frame with a polycarbonate diffuser and comes with a large terminal block for easy installation. For other decal configurations, you can select either EXJUMBO40MRAL (right arrow) or EXJUMBO40MLAL (left arrow). Suspend using chain or rod, or mount on wall or ceiling.